Teal sky and specked earth.. A perfect size for designing over a couch, bed or mantle. Need to fill a little more space? add 10" "Touch of Green, "Denver" and "Urchin" spaced under this piece for a wow presentation! Measures 38" x 10" x 3/4" and hangs vertically or horizontally. Allow 2-4 weeks, sometimes on hand. Inspired by the morning sun and new beginnings; this is one of the artists personal favorites. A speckled patina varies in color from a fossil like brown to spots of dark blue to turquoise. There are also many subtle inward bends that echo the rays of copper. The subtle bends add another design element, increase the stability, and allow the light to play on the surface of this piece. This piece is signed by the artist. Many of the same techniques are used here as are in "Tranquil Waters" but featuring an art deco style sunburst on the horizon. The sunset sky is created with the use of a torch and each piece will vary. Sometimes some amazing cloud- like shapes happen as seen in this image. The horizon and water are created with chemical patinas. Measures 38" x 10" x 3/4". Allow 2-4 weeks turn around. This spectacular copper triptych will literally stop your guests in their tracks! The continuous scene of forest was inspired by the artist's photographs taken in the quaint, seaside town of Tiverton, RI. 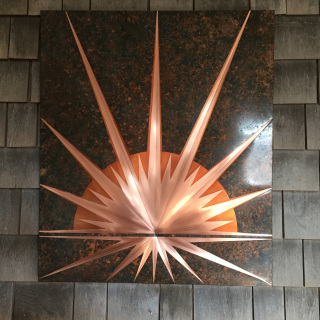 The satin finish on the copper allows for a beautiful play of light to dance across the surface of these pieces. As the light changes throughout the day, so will the triptych. On an overcast day, light seems to illuminate from within the copper itself, while on a sunny day the light is more reflective. Each panel measures 34"x14" x3/4" , when hanging, allow for 3" between each panel. 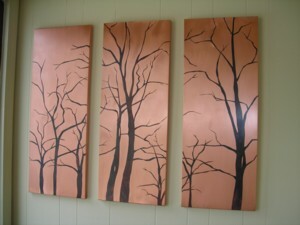 *Also available in reverse, with speckled background/copper trees. Made to order, check with artist on delivery times. 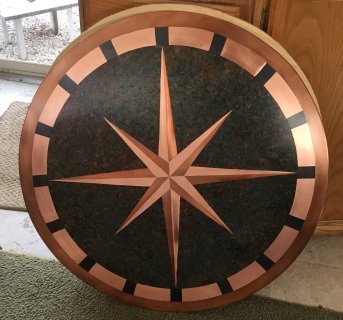 Copper Wall art with Patina 15 1/4" x 7". The sunset sky is created with the use of a torch while the ocean blue color is created with salts and acids. This piece is made to order; allow 2-4 weeks for delivery although occasionally on hand. Also avaiable in larger size. Contact for quote on larger sizes.